At present, there are overwhelming experimental evidences for existence of transverse MO effect. The transverse Kerr effect is the oldest observation of the transverse MO effect. Odd transverse effect in transmitted light, an optical waveguide having non-reciprocal phase shift and hybrid waveguide (isolator) are another examples when the transverse MO effect was experimentally observed. Oldest observation of transverse MO effect is transverse Kerr effect. It states that the absorption of the light reflected from a metal, which is magnetized perpendicularly to the incidence plane, is different for two opposite directions of the metal magnetization. The effect is linearly proportional to the magnetization and non-reciprocal. For the long time, the effect was attributed as a specific feature of the magneto-reflection. 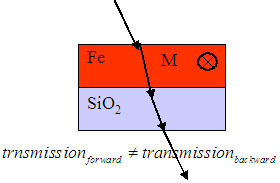 When light is transmitted through a thin film of a ferromagnetic metal grown on transparent substrate, the transmission is different for opposite magnetization of the metal. The effect was calculated by solving Maxwell's equations. The calculation were in correspondence with experimental data. The origin of the effect was not explained. In the case of a waveguide covered by a transparent MO material the propagation speed of waveguide mode changes when the applied magnetic field is reversed. 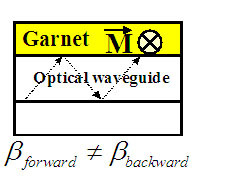 In 70th – 80th several groups did research on waveguide optical isolator made of magnetic garnets. It was difficult to fabricate a Faraday rotator using waveguides because of the problem of TE-TM mode mismatch in the waveguide. It had been found that in case of the waveguide magnetized particularly to the waveguide mode propagation direction, the propagation constant of waveguiding mode changes with reversal of the magnetic field. This effect is non-reciprocal. Since in waveguide a wave undergoes multi reflection from boundaries, the effect was attributed to magnetically dependent phase shift during reflection. The waveguide isolator utilizing effect of non-reciprocal phase shift does not suffer from TE-TM mode mismatch and it was successfully fabricated.